Does your family love musicals like mine? 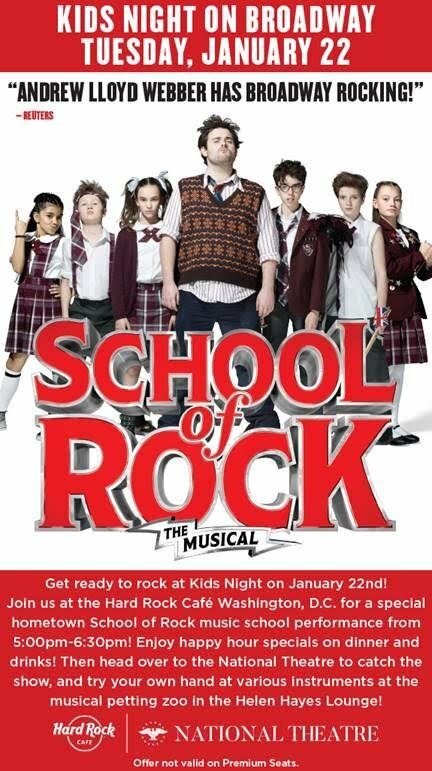 Then your teens and tweens will love School of Rock on tour. Check out our review! This post contains affiliate links. I received tickets to the show to facilitate this review. My family and I were thrilled to be invited to School of Rock last night at DC National Theatre. My entire family loves musicals! Both of my 12-year-old daughters are involved in school theater, both on stage and on the crew. And one daughter is a new guitar player, learning rock history and how to play just like the kids in the show. We always enjoy seeing a musical that involves kids. 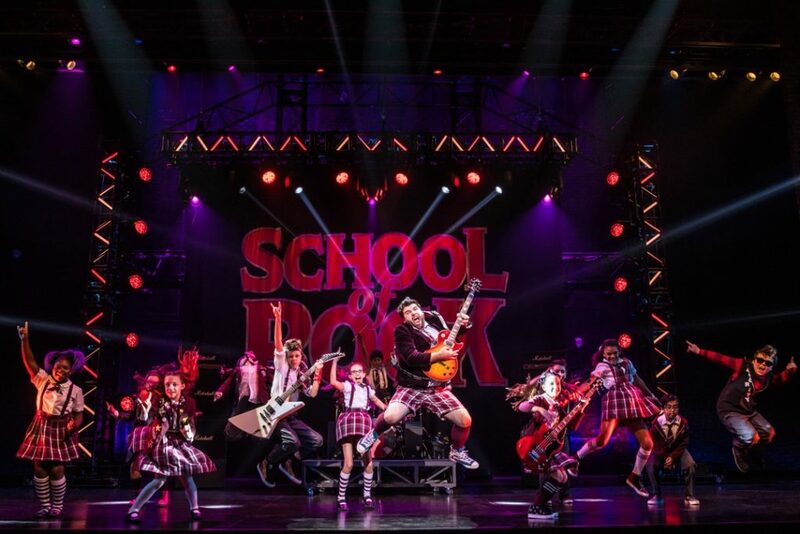 Many families like to take their family to see Annie or Newsies, and School of Rock is another show that will inspire kids to try something new. Even if your family are not theater fans, I think they’ll love this show! My tweens, teen and husband all said they thoroughly enjoyed it. One tween said her favorite part was the music. She loved how funny the lyrics were and the talent of all the performers. My husband thought the set was so clever. It was minimal but was used well to show different parts of the school for different scenes. He was a little disappointed that a song he knows from the Broadway Cast Recording (Give Up Your Dreams) wasn’t in last night’s performance. My teen was surprised at how funny the show was, and he was so impressed by the young kids’ talent. They were amazing! Some were as young as 9, and YES they really play the instruments on stage. My favorite part was getting to relax and enjoy this together as a family. It’s hard to find the time or the right activity to unite tweens and teens with our busy lives of school, sports and work. This was just what I needed! The show recommends the audience be 8-years-old and up, but we discussed this as a family and thought it should be 10+. The movie is rated PG-13, and I’d say the show follows that. There are some curse words, but more importantly we felt that younger kids might not follow the story. Seeing the movie beforehand would help with that. You can also listen to the soundtrack ahead of time–if you have Amazon Prime, you can stream the music. Of course, the music was LOUD and there were lots of flashing lights. You know your child(dren) best, but I definitely recommend the experience for tween- and teenagers. Last there were some younger kids in the audience who kept leaving the theater with a parent. If your child cannot sit that long (and this was a 7:30-10:00pm show), please keep that in mind. I have more tips on taking kids to the theater. 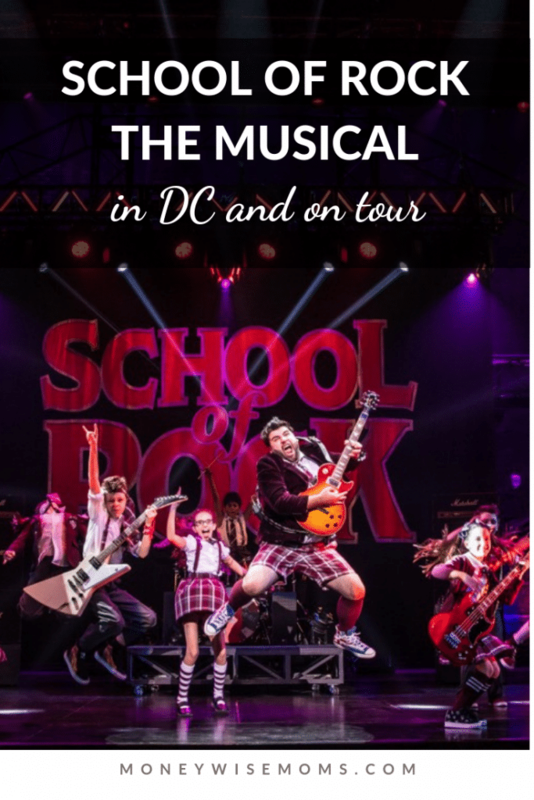 You can see School of Rock right here in DC at the National Theatre through January 27th. If you live elsewhere, find a theater near you can catch it on its US Tour. Go through the National Theatre box office to purchase tickets. The show runs through January 27th. Get BOGO tickets for Tuesday, January 22nd when you use coupon code DRUM. That’s “Kids Night” and you can also get special deals at the Hard Rock Cafe between 5:00-6:30pm. You can find tickets for selected dates and times for 30% off when you use my referral link at Certifikid.